Our friend Christopher Hull, Ph.D., Executive Vice President, of the Center for Security Policy just shared an eye-opening study with us, that demolishes the liberal shibboleth that “gun free zones” make schools safer. You can read the entire study through this link, and it is well worth the time. Hull’s study confirms the argument President Trump made after Parkland that a gun-free zone “is like target practice” for school shooters such as the alleged Florida killer, Nikolas Cruz. Naturally, the Left and squishy Republicans went nuts, but Dr. Hull’s study supports President Trump’s position. Hull crunched the numbers on school shootings per year, number killed per year, and number wounded per year for the period 1968-1990, before the Gun-Free School Zones Act (GFSZA) was signed into law, and after it was put in place (1991-2018). 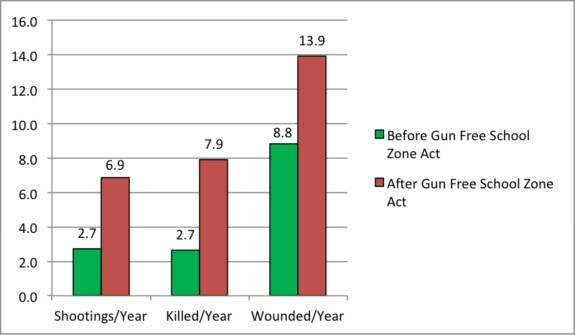 In the period after enactment of the Gun-Free School Zones Act, Hull found school shootings more than doubled from 2.7 per year to 6.9 per year, an increase of 155% from the period before enactment. Those wounded in school shootings nearly doubled from 8.8 to 13.9 per year, an increase of 58%. And killings in school shootings nearly tripled, from 2.7 per year to 7.9 per year, an increase of 192% Hull determined. A closer look at the data bears out that the number of school shootings has increased over time, and generally accelerated after the GFSZA was signed into law in 1990 Hull found. That said, there is an exception that may prove the rule: The Supreme Court declared the GFSZA law unconstitutional in United States v. Lopez, 514 U.S. 549 (1995). Only later did Bill Clinton’s then-Attorney General Janet Reno propose changes that conformed it to the Constitution. Those changes were signed into law in 1996, but doubts remained at least until 2000 about the measure’s ability to withstand a court challenge. During that period, school shootings declined, then rose again afterwards. An obvious question this raises said Hull is whether homicide rates increased more generally at the same pace and with the same timing. Does the spike in school shootings just track a spike in killings? The homicide rate actually dropped steeply in this period. The crack wave was ending, sending murder rates back to levels not seen since the early 1960s Hull found. More specifically, says Dr. Hull, the firearm-related deaths for youths ages 15-19 in particular followed an almost identical pattern, spiking from 1970 to the early 1990s, then plunging back to prior levels – nearly the opposite of the school shooting pattern. Thus, the increase in number and lethality of school shootings can be explained neither by homicide rates in general nor firearm-related death rates among youth says Hull. A counter-argument often advanced by gun control advocates is that mass shootings have increased more generally over that period, which is true. Is the increase in school shootings before and after the federal government declared schools to be off limits to law-abiding gun owners merely an artifact of an increase in mass shootings more generally? The answer again is no, says Hull. According to data compiled by the far-left Mother Jones, it’s true the percentage of those wounded in mass shootings who were shot in schools was cut in half after the Gun-Free School Zones Act passed, from 32% of mass shooting injuries between 1982 and 1990 to 14% from 1991 to today. Also, Hull found this drop took place despite the percentage of mass shootings that took place in schools growing from 11% to 17% of all mass shootings at the same time. But the apparently positive change appears to be because schools shootings became so much more lethal said Dr. Hull. The percentage of mass shooting fatalities that took place in schools tripled, from 7% before the Gun-Free School Zones Act to 21% afterwards. So: Half as many injuries in schools among mass shootings, but only because three times as many died in a greater number of mass shootings there. The bottom line: After America declared schools gun free zones, school shootings increased and became deadlier. By these measures at least, Dr. Hull’s study found that President Trump is right, and gun control advocates are wrong.